Metal clay is an amazing material which allows complete beginners to create solid silver – or gold, bronze, copper, brass, steel or iron – jewellery quickly and easily. So, what is metal clay? The ingredients are just fine metal particles, an organic binder and water. They can be worked in the same way as ceramic clays – rolled, formed, textured and cut. When the water is allowed to evaporate and the dry piece is fired, the result is a solid metal item. Fine silver metal clay, once fired, is hallmark quality silver as is the Sterling silver metal clay. There is also a 22ct gold variety of metal clay which works the same way. Silver and gold metal clays have been available to the public since the mid-1990’s. Mitsubishi and Aida Chemicals make Precious Metal Clay (PMC) and Art Clay Silver brands respectively. What is Base Metal Clay? The term base metal clay refers to any clay that is not a precious metal – so bronze, copper, steel and iron metal clay fall into this category. Bill Struve from Metal Adventures was the first person to develop bronze and copper clays which come as ready mixed lumps of clay and have the brand name Bronzclay™ and Copprclay™. These were released in mid 2008. 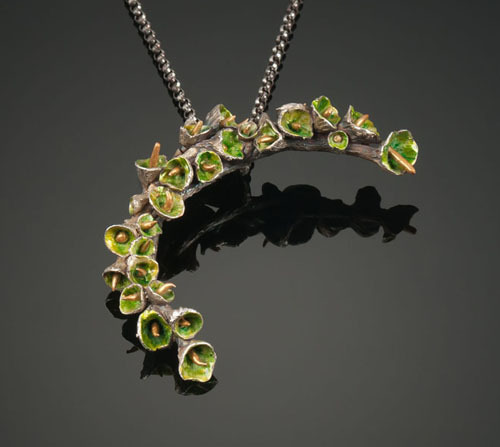 Hadar Jacobson has produced bronze and copper clays that come as powders which you mix with water. 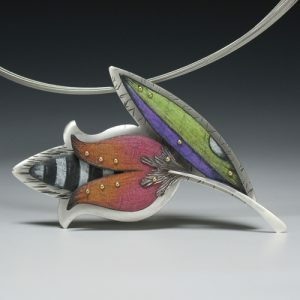 Both these products work in a similar way to the silver and gold clays although the firing is more complicated. The original bronze and copper clays require an oxygen free environment to fire so the dried pieces are buried in activated carbon in a stainless steel pan and fired in a kiln. They cannot be torch fired and require a very long firing in the kiln. The makers of Art Clay, Aida Chemicals launched their own copper clay, called Art Clay Copper, in September 2009. This has a much simpler firing schedule than the other copper clays available and can be torch fired or kiln fired. Prometheus Copper Clay was developed in Turkey. Prometheus Copper Clay fires in 30 minutes at 850 degrees C and requires no special firing pan. And it comes as syringe clay as well as lump clay. Hadar Jacobson launched a copper clay powder and a bronze clay powder with a simpler firing schedule in December 2009. They are called Quick-Fire Copper and Quick-Fire Bronze. Prometheus™ bronze clay is also available. Developed in Turkey, this bronze clay has a shorter, lower temperature firing schedule without the need for activated carbon. It still needs a kiln to fire it for best results. Available as lump clay and in syringe form. Hadar Jacobson has also developed Stainless Steel Clay which became available in December 2009. It comes in two forms, traditional and Quick-Fire. Hadar launched White Bronze Clay in early 2010. In June 2010, Pearl Grey Steel clay powder became available. In July 2011, Hadar launched Rose Bronze Clay. In 2010 Mitsubishi launched PMC Pro. This clay is 90% silver and is very strong. Hattie Sanderson did some studies of its working properties and it is recommended for rings or elements which need strength. This clay has now been discontinued. Bill Struve launched Fast Fire Bronzclay™ in July 2010. This cut down the firing time considerably. In December 2010, Meteor bronze clay was launched by a French developer and then Meteor copper clay was released in January 2011. Meteor white bronze clay was launched in July 2011. They have a number of varieties of bronze clay giving different colours. The PMC Studio in the UK launched Creative Copper and Creative Bronze clay on 7th October 2011. This is made in Turkey by the same manufacturer as Prometheus Bronze clay and works the same way, essentially, it’s the same product repackaged. In May 2012, Hadar Jacobson introduced Bronze XT which looks like regular bronze, but can be fired at a high-fire schedule, at the same temperature as Hadar’s steels, copper and Rose Bronze. That means that it is possible to fire a mix of copper, Bronze XT and steel clays in the same piece without limiting the design and the amount of steel. In June 2012, Hadar Jacobson introduced Low Shrinkage Quick-fire Steel XT which shrinks only 10%, like Hadar’s Quick-fire copper. This makes it easy to work with on its own, as well as in combination with other metals. Noble Clay™ Bronze Dark Color was launched in July 2012. Developed in Poland, this clay has a two stage firing process. Noble Clay appear to have gone out of business. Goldie Bronze™ and Goldie Copper™ clays have been developed in Poland by Waldo Ilowiecki and were launched in August 2012. There is also talk of Waldo developing an Iron Clay – watch this space! Hadar Jacobson launched Brilliant Bronze (golden colored bronze) in September 2012. Cinter Bronze Clay and Copper Clay were developed by and is available from Cindy Berg in the USA. Zabs Bronze Clay is available through Etsy. It was developed in France. Metal Clay Zab’s Bronzes™ are available in three colors, Luna Bronze™ a white bronze, Sol Bronze™ a golden bronze and Rojo Bronze™ a red bronze. In April 2013, Hadar Jacobson launched Smart Bronze. It is a copper alloy which, after firing, has the color of 24K gold. The shrinkage is 23.5% for flat pieces and 2.5 sizes for rings. Since it is base metal, it needs to be fired in carbon, but does not require pre-firing. In January 2014, Hadar Jacobson launched Champagne Bronze. In January 2014, Hadar Jacobson launched Friendly Copper. This new copper clay fires in one step only (no second phase required), at the same firing schedule as Champagne Bronze and Low-shrinkage Steel XT. All three clays, on their own and in combination with each other, fire in carbon for two hours at 1750°F (brick kiln)/1830°F (muffle kiln). In March 2014, Metal Adventures launched White Copprclay. NOTE: WHITE COPPRclay is composed of copper and nickel. Customers within the European Union, please be aware that this item contains nickel and may not be in compliance with EU regulation EN1811-2011. In March 2014, Meteor Clay introduced a new Premium Steel Clay with a one step firing schedule. In November 2011, Mitsubishi announced that they’d developed PMC Sterling which was launched in the US in December 2011. In November 2012, Aida launched a new formula Art Clay Silver. It has a longer working time, has better workability and only 8-9% shrinkage. This is now the standard version. The well established manufacturers continue to develop new varieties of clay. There are now also new brands of silver metal clay with varying qualities. In February 2014, Celie Fago shared her experiments of mixing PMC Sterling with PMC3 to create a strong clay that can be open shelf fired. This results in silver which is 960 parts per thousand of silver and conforms to the Britannia silver standard in the UK. In July 2014, Mitsubishi announced a new PMC clay – PMC Flex – in a video on YouTube. Two years in development, this new clay brings the longest working time of any of the current silver clays. 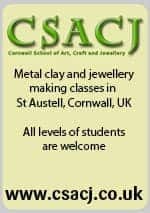 It launched on 22nd September 2014 and you can see two videos showing experiments with PMC Flex from the Cornwall School of Art, Craft and Jewellery, here and here. Aussie Clay have also produced a Superflex fine silver and a 960 clay type. Their Origami silver clay type comes as fine silver and 960 clays. The Origami formula is brilliant for creating very thin sheets that you can fold into Origami designs, cutting out on the cutting machines and using in punches and still great for texturing and moulding. The clay is very strong as a thin sheet. In November 2014, For Your Inspiration, or FYI, was introduced. The fine silver variety has 20% shrinkage, open shelf firing and results in fine silver pieces. Firing between 1545F to 1635F (840C – 890C) from 30 to 90 minutes. There is also a 960 variety. Aussie Metal Clay launched in 2014 and became available worldwide in 2015. It is available in a wide range of bronze colours, copper, 960 silver and 999 silver. MetalMagic Silver clay launched in 2015. Exclusively from MetalClays this fine silver metal clay features great working time, high detail pickup and the best price in market. Five Star brand copper and bronze metal clay are sold through Clay Revolution. They were developed by Carrie Story. 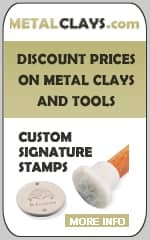 Five Star Metal Clay has all of the features you desire in base metals; fires simply and fast, ultra refined metal powders create a smooth finish, easily carved and worked on cutting machines, all colors can be fired together, and comes in five great metals. In June 2016, a new clay developed by Bill Struve was announced. EZ960 is a Sterling silver clay that can be open shelf fired. It is available through Cool Tools. In September 2016, Metal Clay Ltd in the UK launched Art Clay Silver 950. Mitsubishi Materials added OneFire Sterling PMC to their product line from September 2016. No more mixing PMC3 and PMC Sterling to get the advantage of superior strength and beautiful finish in a clay you can legally mark Sterling. Firing is as simple as putting it in a cold kiln – no carbon and no ramp holds – and ramping at full speed to 900C/1600-1650ºF and hold for one hour. Available in the UK from the PMC Studio in and in the USA from Metal Clay Supply. Prometheus launched two silver clays in June 2017. Prometheus® Silver Clay 950 will give you the ability to design stronger and bendable jewellery. It does not require activated carbon or multiple steps firing. Just put your dried pieces into your kiln at room temperature on a kiln shelf and full ramp speed to 800°C/(1470°F) for 1 hour. The shrinkage of Prometheus® Silver Clay 950 is 15%. You can hallmark your pieces as Sterling. Prometheus® Silver Clay 999 will give you the ability to design stronger and bendable jewellery. It does not require activated carbon or multiple-steps firing. Just put your dried pieces into your kiln at room temperature on a kiln shelf and full ramp speed to 570°C/(1058°F) for 1 hour and the shrinkage will be 12%. If you would like to bend your fired pieces into bracelets or ring loops than fire your pieces from room temperature to 700°C/ (1292°F) at full ramp for 1 hour and the shrinkage will be 13%. Cyprus Copper Clay was launched in late 2018. It was developed by Cindy Silas and is available from Cool Tools. Cyprus Copper Clay is an excellent base metal clay medium for jewelry, crafts, sculpture and models. Offered in lump (wet) form, this clay is waterbased, air dries and fires to .999 pure copper. Economical, easy to form, fire and finish, the fired clay presents as beautiful on its own or as the perfect platform for enameling projects. As the medium of metal clay continues to evolve, it becomes more difficult to quickly answer the question ‘what is metal clay’. Here at the Metal Clay Academy, we continue to gather the latest developments in one place so hopefully if someone asks you ‘what is metal clay?’ you’ll be able to answer them! 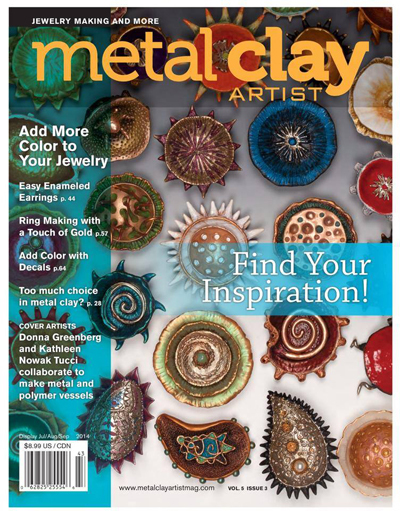 If you are a complete beginner, check out our metal clay beginners page. 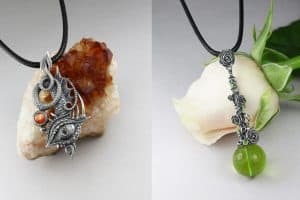 You’ll find basic information, links to more resources and a useful article about how to work with metal clay without spending lots of money on tools and equipment.